The doors in your home are a barrier to the outside, providing security and climate control for what's on the inside. Properly installing and maintaining your doors, both inside and outside, will keep your home safe. This section of tips can help you deal with door problems. From loose doorknobs to drafty doors to weather stripping, you'll find the information you need here to keep your doors in great shape. The following articles are available for the 'Doors' topic. Click the article''s title (shown in bold) to see the associated article. A doorbell is rather useless if it does not ring. Learning to fix your doorbell is easy and extremely useful. Fixing a loose doorknob is a very useful skill that is easily acquired. Your family and neighbors will thank you for learning this simple skill. A squeaky door results from a squeaky hinge. Lubricate all parts of your door hinge and then reinstall the door. Chances are you will fix the squeaking door by using a simple lubricant on the hinge. While installing a deadbolt lock yourself can be simple, the project does require a few tools and a little know-how. Read the directions on your deadbolt kit and use the recommended tools. Deadbolt locks not only make your home more secure, you can buy them in an array of finishes to match your doorknob and decor. Of all the possible ways to make your home a little safer, one of those most commonly used options is a deadbolt. However, is it possible to install a deadbolt on one of those new aluminum doors? Luckily, the answer to this question is a resounding yes. Here's how. If you have a pet, then chances are pretty good you get a little tired of constantly taking your fuzzy friend outside all the time. One way that you can get over this frustration is by installing a doggie door. You would be surprised at how easy it is to get these installed yourself. Patio doors are a great way to bring the great outdoors inside your home, and one of the most popular choices are hinged patio doors. Installing a hinged patio door, on a technical level, isn't that difficult. However, it will take you up to nine hours depending on your skill level. Here's how you do it. Although pocket door kits include most of the hardware you will need to install your door, you may need to buy a handle. Keep in mind that the weight of your door determines the pocket door hardware kit you need. Different door weights require different hardware. Keep on reading to learn more about the basics of installing a pocket door. Whether you are looking to make your home a little more energy efficient, or you simply want a change, installing a prehung entry door can do it. While you can always hire someone to do the work for you, why would you? Do the work yourself, and save yourself some extra money. All you need is the proper tools, the instructions, and about three hours of time. During the hotter months of the year, a storm door can be an invaluable asset. But what do you do when you do not currently have a storm door? Why, install it of course! Installing a storm door is a great simple project that you can accomplish in about an hour, as long as you have all the parts and pieces together. Installing energy efficient doors is a great way to help reduce your overall heating or cooling bills. While you could hire someone to do the work for you, why not do it yourself? It's not all that difficult, at least if you follow these directions. When you install a door, or replace an existing door, your job isn't really finished until you have installed the molding. Installing molding for interior doors is actually pretty easy, and will only take you about an hour to do. All you need to do is follow these simple instructions. Keeping up on the maintenance of your doors can help prevent having to replace parts as well as avoid the frustration of having to fix a broken door. Here are some tips on keeping your doors working properly. Instead of completely replacing a door, and spending loads of money that could be better used on a different project, why not try refinishing your door instead? Here is how you can do that. There is more to door latches than simply helping your door look better. In fact, if your door latch isn't in good working order, you can find yourself having trouble getting the door to close. Luckily repairing a door latch isn't all that difficult. Over time just about everything in your home will need to be repaired, even the little strike plate on your door. Luckily, repairing a strike plate is an extremely simple project. It is so simple that you can actually get the job done in less than thirty minutes. Over time, it's quite common for just about every part of the house to need a little repair work done. Usually one of the first things to need that kind of help would be the door, or door trim. This is due to all the wear and that we subject our doors to. Repairing door trim is actually something that anyone can do, and here's how. While dealing with a drafty door can be annoying, causing you to be too hot or too cold inside, it can also mean that you're paying a heftier energy bill each month. Since doors are used frequently, it can be difficult to keep them weather-proofed. If you find that you have gaps and you can see daylight through them, it might be time to replace the door. Although replacing a deadbolt is generally easier than installing one, some models may be slightly different than your old one, and a bit more difficult to handle. The steps to replace a deadbolt are the same for removing one—just in reverse. Remember the steps you take to remove your deadbolt, and replacing the new one will be a snap. Replacing a torn window screen is a remarkably easy project, and one that anyone can accomplish. Don't let ugly torn, or damaged window screens ruin your view, or the look of your house. Take care of the problem today! Here's how. Over time the average home owner will need to replace just about everything in their home. However, instead of replacing an old door, why not try restoring it? 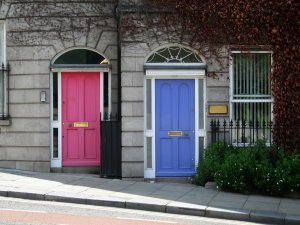 Restoring old doors isn't particularly difficult, at least if these directions are used and followed properly. One of the more common problem spots in any home is the doors. For some reason, doors often seem to have more problems than just about any other part of the home. Learning a few simple door repairs can not only make your home a little nicer, it can make your day just a tad more enjoyable as well. Chances are that if you walked through your home right now, you could find at least one door that has a loose door hinge. If you have ever wondered what you need to do in order to go about tightening a door hinge, then keep reading. Here are some of the best and easiest methods for tightening a door hinge yourself. There are a few simple types of home maintenance that all homeowners should know how to do, and one of those is tightening up loose hinges. Every so often a door hinge will become loose, and if you don't fix it correctly it can become a rather large problem. Luckily it's not particularly difficult a task to accomplish. For some reason, when most people pick out the doors that they will use for their home they over look one major aspect, the types of locks. There is more to a lock than simply something that will lock your door. Some locks are more secure than other kinds, and it never huts to have as much information as possible when looking at the possibilities. Weather stripping can help you maintain temperatures in your home and reduce dampness. Learning to weather strip your own doors can save you a significant amount of money. Next time you get your energy bill, you might be surprised to find out how large it is. One way to combat this rising cost is to check the weather stripping on your doors and windows. Here is how you can replace that worn and out dated weather stripping, and thereby cutting the cost.